The Sammy Showcase is a fun, family-friendly game festival featuring videogames and virtual reality games created by UCSC students. The future of games will be on display at the Sammy Showcase, one of the largest student game festivals in the country, featuring novel and creative videogames and virtual reality games created by undergraduate and graduate students in the world-renowned game design programs at UC Santa Cruz. 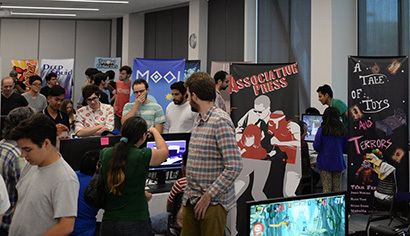 The annual event is free and open to the public, offering visitors an opportunity to play innovative new games, meet the student creators, and attend presentations on the latest game-related research. The Sammy Showcase takes place on Saturday, June 9, from 1 to 6 p.m. at the UCSC Silicon Valley Campus (located at 3175 Bowers Avenue in Santa Clara). There will also be a live stream of the event on Twitch (twitch.tv/ucscgpm). More than 50 games will be presented by students in the full range of game design programs at UC Santa Cruz, in both the Baskin School of Engineering and the Arts Division. UCSC student games have won many awards, and both the undergraduate and graduate programs are ranked among the top in the nation by the Princeton Review. UC Santa Cruz is also the top-ranked institution in a recent survey of institutions involved in technical games research. UCSC faculty and graduate students are at the forefront of innovations in areas such as the use of artificial intelligence, virtual reality, and wearable technology in games. Graduate students will be giving talks on these and other topics at the Sammy Showcase; talks will be streamed on YouTube (YouTube.com/playableUCSC). The student games will be evaluated by a panel of industry experts, and awards will be given based on design, technical, and artistic achievement. For more information about the Sammy Showcase, contact Bennett Williamson at (831) 459-5628 or bennett.williamson@ucsc.edu.